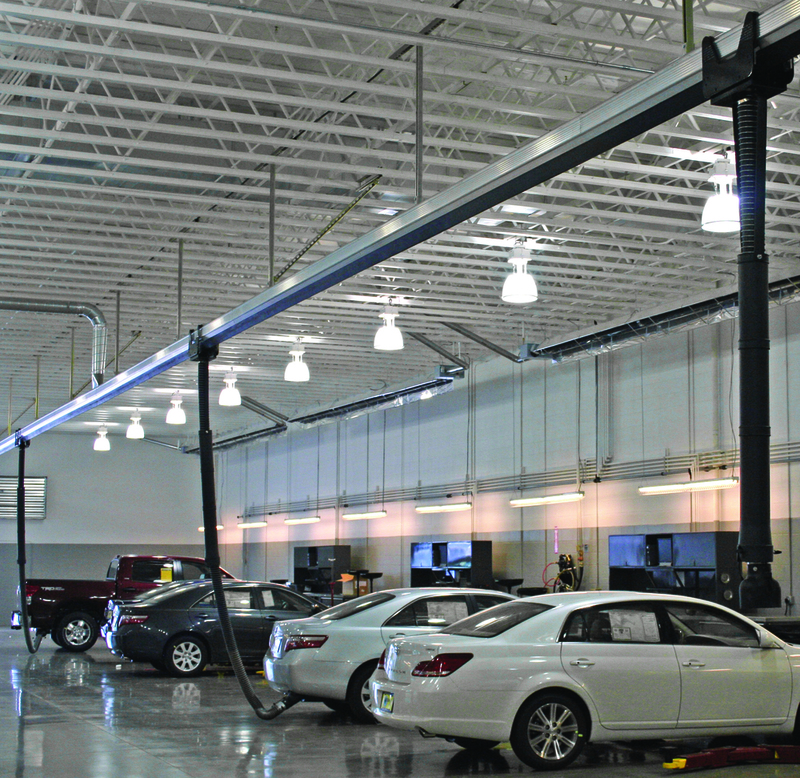 For 15 years Ascent Systems has designed and installed automotive systems for dealerships, high performance facilities, and light construction needs. Our systems are versatile, made with quality components, and affordable. The Vacuum Holster™ offers simple and easy operation for service technicians. The exhaust hose is flexible and easy to maneuver, and provides excellent coverage. It’s simple to attach the tailpipe adapter to any vehicle, and its rubber boot and attachment device will not scratch vehicles. Whether in a fixed-mounted configuration or used in conjunction with the Apex Rail, the Vacuum Holster uses the suction of the exhaust fan to assist in retracting the exhaust hose into the Hose Holster. A closed damper utilizes the negative pressure that restricts airflow into the hose. This pressure assists in retraction of the hose and tailpipe adapter into the hose holster for storage. This makes it easy to retract and creates a clean, professional facility appearance. And our unique Remote Start option give technicians ability to start/stop the exhaust fan from each bay. Since our inception, we've designed and installed systems for many types of automotive facilities. Keeping heat and A/C in, and unnecessary costs out. While other systems may offer dampers as accessories, only the Vacuum Holster requires the operator to close the damper in order to retract the exhaust hose. This means that out-of-use hoses do not exhaust heated/cooled air. This results in lower energy costs. The heat loss—and consequent utility expenses —that can occur because of undampered hose drops can be surprisingly high. An Ascent Systems rep can quantify the heat loss that would arise with an undampered system, and can estimate the energy savings that would result from a dampered system. Just let us know the parameters of your proposed system, and we can produce an estimate! Made domestically, made to last. From the exhaust fan to the tailpipe adapter, every component used in our systems has stood the test of time. We work with trusted suppliers and ensure that quality, fit and installation are of the highest quality. This self-contained exhaust kit includes a 120V plug-in fan, a Holster/Hose, and a Tailpipe Adapter. It's available as either wall-mounted or ceiling-mounted. Our products create a cleaner, healthier, and more professional environment for service technicians. The user-friendly operation of the Vacuum Holster makes it convenient for technicians to capture and evacuate emissions from vehicles. The patented retraction method guarantees no awkwardly hanging hoses, and the overhead exhaust system approach ensures there are no open or broken door ports, as with underground systems. The Vacuum Holster system is competitively priced with budget-friendly systems, while offering high quality components and an aesthetically pleasing appearance. The simplicity of the system’s design limits replacement and maintenance costs. Unlike underground systems, the Vacuum Holster does not require periodic clean outs. Automotive Vacuum Holsters are light enough to be suspended from the exhaust duct manifold, requiring no additional bracing from the structure. Our network of installers are experienced and can assist in designing a system that best suits your needs. Interested in more automotive product options?